Brighton boxer Freedom Eubank looks like losing his liberty after a judge issued a warrant for his arrest today (Monday 18 March). Eubank, 28, of St Helen’s Road, Brighton, was due to be sentenced for dangerous driving at Lewes Crown Court this morning, having been charged after a police chase through Brighton. 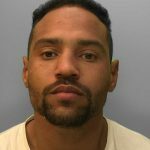 The defendant – a cousin of the IBO world super-middleweight champion Chris Eubank Jr – was spotted by Sussex Police in Eastern Road, Brighton, on Saturday 1 December. He was found guilty of driving dangerously in Bear Road – a charge that he had denied – at Brighton Magistrates’ Court last month. The bench committed him to the crown court for sentence because the magistrates who convicted him did not feel that they had sufficient power to punish him. But this morning he failed to turn up for his clash with justice. The court heard that he was suffering from a bout of diarrhoea and sickness. Judge Christine Laing, the honorary recorder of Brighton and Hove, gave him until noon to provide evidence such as a doctor’s note. But the gloves came off in the absence of evidence and the court issued a warrant for Eubank’s arrest.